It’s one of the few foods that seems to have universal praise for its health benefits. So can one of the oldest super foods around be good for our dogs too? In moderation, raw honey does make a healthy treat for our dogs. Not only is it full of nutrients, including vitamins and minerals but it also contains proteins, essential oils and phytonutrients that are essential for health. What’s more due to the abundance of flavonoids it contains it’s also believed to have anti cancer fighting properties. And if that still isn’t enough to convince you of it’s status as a health food, it’s also antibacterial, antiseptic and antifungal. However, the crowning glory in terms of the types of honey available is a variety called manuka from New Zealand. Extracted from the pollen of one plant; the manuka tree, it is one of the purest honeys available. Whereas most varieties are blended with other ingredients such as sugar, corn syrup and other artificial sweeteners. Manuka in contrast, is much better regulated. This means that any beneficial properties it contains are more consistent than other types. So if it says manuka on the label you can be sure of what you are getting. With that said any raw honey is packed full of goodness. So if you have trouble finding manuka, or can’t afford the price tag, look for a local raw, organic variety. Because the taste varies so much due to the blend of pollen that the bees collect, it’s well worth experimenting with different types and flavours until you find one that both you and your dog enjoy. What can honey be used for? Just like us, our dogs can suffer from seasonal environmental allergies like hay fever. Giving your dog a daily dose of raw, local honey can help relieve symptoms. Not only that, but honey is also good for digestive issues. Because it contains live enzymes and amylase, it aids with the proper digestion of carbohydrates and soothes the digestive system. It’s for this reason, combined with it’s antibacterial properties, that honey can help reduce the symptoms of IBS, colitis and gastritis. Believe it or not honey can also help heal wounds. When applied to a cut or to an open wound, its antibacterial and antiseptic properties help reduce swelling, kill bacteria and seal the wound to protect it from further infection. It has also been used to lessen scarring and ease pain. When you add up all of these benefits, it might explain why honey appears in so many skin care products. The softening and calming affects of the nectar are well known. For dogs with dry, itchy or sore skin, honey, when applied topically or in the form of a shampoo can offer long term relief. What’s more, honey is also known to be easy to digest which means that it can also provide a good energy boost for dogs that are elderly or recovering from illness. It is easy on the stomach and tasty enough to tempt a dog to eat even when unwell. So now you know the many benefits of this golden nectar, why wouldn’t you you feed it to your dog? Despite honey being such a great all round super food, it still may not be suitable for all dogs. Regardless of the many benefits, honey does have a down side. It has a high glycemic index and ranks 58 on the scale. Essentially, this means that it is likely to have an adverse effect on blood sugar levels. Therefore, making it unsuitable for dogs that are diabetic or have any issues with blood sugar levels. Unfortunately, most of the honey available in supermarkets is a processed product. Not only is it blended with other sweeteners it goes through various processes so that any bacteria is killed. Although that may seem like a good thing, it does affect the nutritional value of the product as well as whether it is suitable for your dog. Some artificial sweeteners are toxic to dogs so always be on the look out for pure, raw honey as it contains the biggest health benefits. One of the drawbacks of raw honey is that there is concern that it may contain spores from anaerobic bacteria that produce the botulinum toxin. Although the risk is small, it’s recommended that it isn’t given to very young puppies as their immune systems are still developing and may not be able to fight the botulism toxin. The last thing on our risk list are those dreaded calories! While honey may be classed as a health food it does contain 20 calories per teaspoon. So if your dog is already on the rotund side, then you may want to think again before offering them this sweet treat. As with any food, the first time you give your dog honey, moderation is key. Ensure that your dog does not have any adverse effects before offering them more or increasing the frequency that you give it to them. So, can I give my dog honey? Yes you can. Honey is a good all round health booster as long as your dog isn’t obese or diabetic. 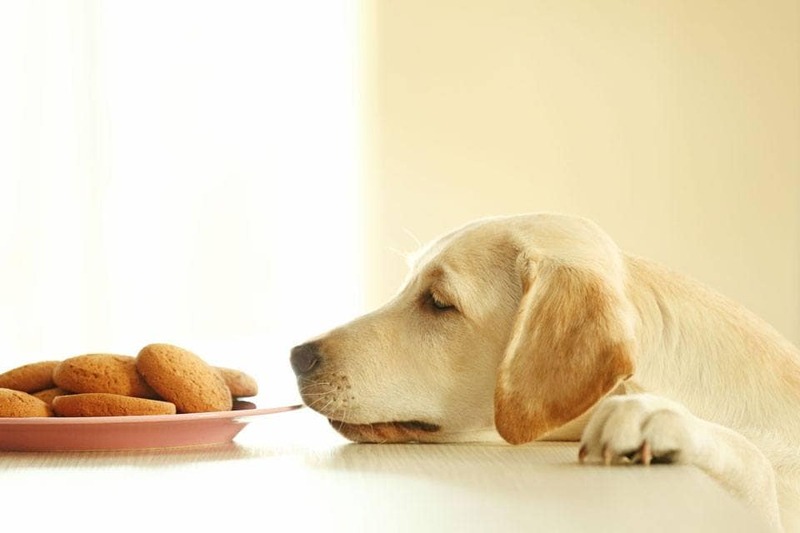 Of course, regularly giving your dog sweet things may have a negative effect on their teeth. But, if you do want to treat your dog to something sweet then honey is definitely on the ‘good’ side of things to feed your dog. So why not try one of these tasty recipes below. Roll out dough to 1/4-inch thickness and cut into mini shapes with your favourite cookie cutter. Roll into 1/2 inch balls and place on prepared baking sheet an inch apart. Flatten with the flour dusted back of a spoon or bottom of a glass.